ROBERT DE VAUGONDY -Nouvelle Espagne, Nouvaeu Mexique, Isles Antiles. ROBERT DE VAUGONDY, G. - Nouvelle Espagne, Nouvaeu Mexique, Isles Antiles. Nouvelle Espagne, Nouvaeu Mexique, Isles Antiles. - ROBERT DE VAUGONDY, G.
Title : Nouvelle Espagne, Nouvaeu Mexique, Isles Antiles.. Size : 9.4 x 12.1 inches. / 24.0 x 30.8 cm. Description :Published by Charles Lamarche. 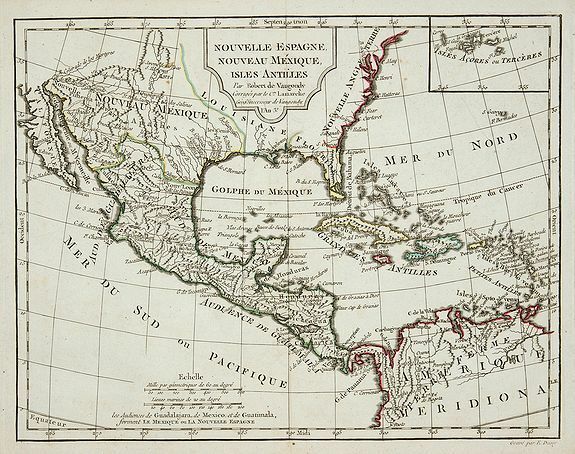 Showing the most notable areas of New Spain in North, South and Central America from Nouveau Mexique to Terre Ferme as well as the Caribbean islands. The map is rich in detail with town, rivers and mountains. California is an peninsula and Florida is the appropriate archipelago. The Mississippi river is truncated and Rio del Norte (Rio Grande) runs north/south. Taos, Santa Fe, and Albuquerque are listed, as well as the Indian nations of the time. Condition : Mint condition. Two light brown spots upper left.